There was Oscar’s, the Brown Bull, Slack Alice’s and Edwardia – Manchester clubs, pubs, night time venues and boutiques. Somehow, amongst all the high-living and fast rolling there was time for the odd football match. And when he played…whew! In his second ever match, Boxing Day 1963 v. Burnley, he left full back John Angus humiliated with what Paddy Crerand described as “twisted blood”. 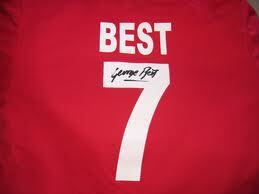 As the old saying goes, Maradona good, Pele better, George best.